Full of courage, yet clown-like qualities. Bat ears and short undocked tail essential features of the breed. Head square, large and broad but in proportion to dog's size. Skull nearly flat between ears, domed forehead, loose skin forming symmetrical wrinkles. Muzzle broad, deep and set well back, muscles of cheeks well-developed; nose and lips black. Stop well defined. Lower jaw deep, square, broad, slightly undershot and well turned up. Nose extremely short, black and wide, with open nostrils and a line between well defined. Lips thick, meeting each other in centre, completely hiding teeth. Upper lip covers lower on each side with plenty of cushion, never so exaggerated as to hang too much below level of lower jaw. 'Bat ears', of medium size, wide at base, rounded at top; set high, carried upright and parallel, a sufficient width of skull preventing them being carried too close together; skin soft and fine, orifice as seen from the front showing entirely. Short, cobby, muscular and well rounded with deep wide brisket; roach back; strong; wide shoulders and narrowing at loins; good 'cut up', ribs well sprung. Small, compact and placed in continuation of line of leg, with absolutely sound pasterns. Hind feet rather longer than the fore-feet. Toes compact; well knuckled; nails short, thick, preferably black. 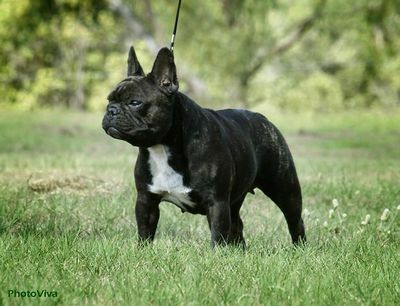 1.Brindle A mixture of black and coloured hairs. May contain white provided brindle predominates. 2.Pied White predominates over brindle. Whites are classified with pieds for show purposes; but eyelashes and eyerims should be black. In pieds the white should be clear with definite brindle patches and no ticking or black spots. 3.Fawn May contain brindle hairs but must have black eye lashes and eye rims. Soundness not to be sacrificed to smallness.